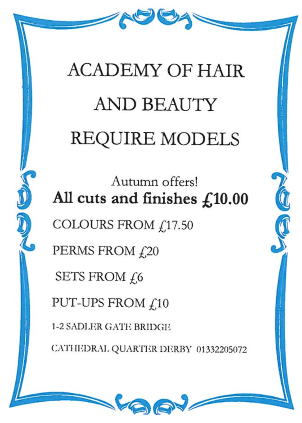 Academy Of Hair & Beauty based in the historic Cathedral Quarter of Derby, offers the following products and services: Hair and Beauty, Hairdressing, Barbering and Beauty Care. We are also a training provider offering Apprenticeship and Work-Based Learning in Beauty Therapy, Barbering and Hairdressing NVQ levels 1-3. Study Programme for 16-19 year olds. Information on courses and enrolment may be obtained by telephone enquiries on 01332 205072 or by writing to Academy of Hair & Beauty, 1 & 2 Sadler Gate Bridge, Cathedral Quarter, Derby, DE1 3NL.